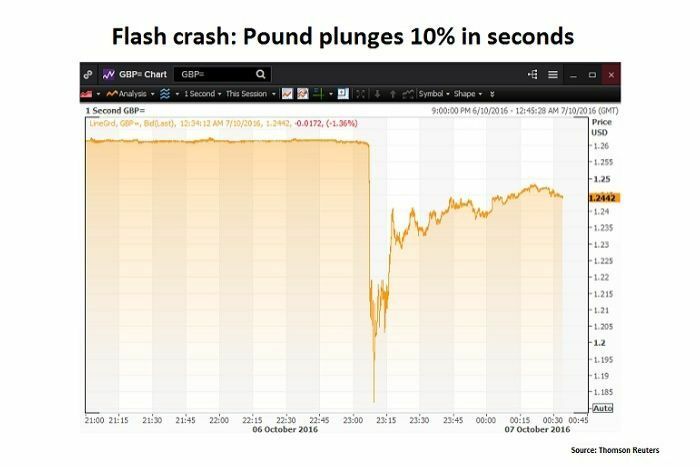 An extraordinary 10 per cent flash crash by the British pound has left currency traders baffled about its cause. At 10:07am (AEST) the pound suddenly crashed from $US1.26 against the US dollar to a fresh 30-year low below $US1.14 in a matter of seconds. Over the next 10 minutes the pound regained much of the loss to be trading down a little over 1 per cent lower in early Asian trade. Currency dealers contacted by the ABC this morning were largely at loss to explain what caused the violent move. However, it was noticeable that the crash occurred on very low volumes and the selling momentum was most likely amplified by the triggering of automatic stop-loss orders. RBC Capital Markets managing director and chief economist Su-Lin Ong said the pound had already been under considerable pressure as fears about a hard "Brexit" mounted. "As far as we can see the only piece of news this morning is a comment from French president Francois Hollande in the Financial Times talking about a hard separation of the UK from Europe," Ms Ong said. "However a lot of similar comments like this have been made before, so it is hard to see a cause. "The speed of the move has go a lot to do with the conditions, sterling (pound) already being under pressure and the thinness of the trade this morning."